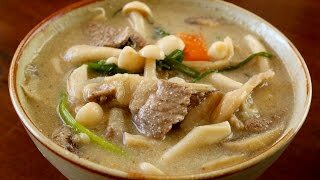 Korean mushroom soup (Beoseot-deulkkae-tang: 버섯들깨탕) is a delicious, nutritious, savory soup made with mushrooms and perilla seeds powder. The perilla seeds powder makes the broth soft and nutty, and the beef brisket and the mushrooms are chewy, soft, and crispy, giving this soup a very unique taste and texture. 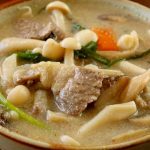 You could make it with just one kind of mushroom but I suggest you use a few different varieties so your soup has different tastes and textures. I used shiitake mushrooms, oyster mushrooms, white beech mushrooms, white mushrooms, and enoki mushrooms, but you could use any other types of mushrooms. Add a bit of beef and this becomes a nutritious, delicious, and hearty meal a family of 4 can enjoy! If you’re a vegetarian, skip the beef and use vegetable stock instead of the water. Enjoy this soup and let me know how yours turns out if you try it! Combine the perilla seeds powder, glutinous rice flour, and ½ cup water in a bowl. Mix it well and set aside. Heat up a heavy pot and add the sesame oil, beef, and garlic. Stir for 2 to 3 minutes with a wooden spoon until the beef is no longer pink. Add 4 cups of water, the mushrooms, onion, and carrot. Cover and let it cook over medium high heat for about 15 minutes. Open and stir. Cover and lower the heat to medium, then cook for another 15 minutes. Stir in the fish sauce, salt, and the perilla seeds mixture. The broth will turn slightly thick and milky. Cover and let it cook for a minute over medium high heat. Add the chives and stir until the chives are slightly cooked. Posted on Wednesday, July 6th, 2016 at 10:00 pm. Last updated on August 28, 2016. Posted January 30th, 2019 at 7:19 pm | Log in to reply. Watched since the first time you made Korean wings in…2008( I think). Your recipes are the only ones I will use when making Korean dishes. Gonna make this recipe tonight!! Posted September 30th, 2018 at 12:59 pm | Log in to reply. My husband and I absolutely love this soup. The first time I made it, I couldn’t find perilla seed powder. But, we’ve recently discovered a Korean grocery store that carries it. Thank you so much for sharing all your recipes. I’ve probably made dozens and dozens of them, all of which are amazing! p.s. We went to the meetup you scheduled in Seoul this past May. It was so great meeting you! Posted October 3rd, 2018 at 8:48 am | Log in to reply. Wow, it looks like mine! Perilla seed powder makes this stew special, but if you can’t find it, toasted perilla seed powder also works well. This recipe was originally posted on July 6, 2016 at 10:00 pm by Maangchi. It was last updated on August 28, 2016. The video was watched 1,931,210 times on YouTube & has 28,448 likes!